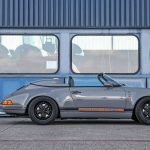 Porsche's 1989 Speedster is an incredibly rare piece of air-cooled history, with just over 2000 units made for the entire world. 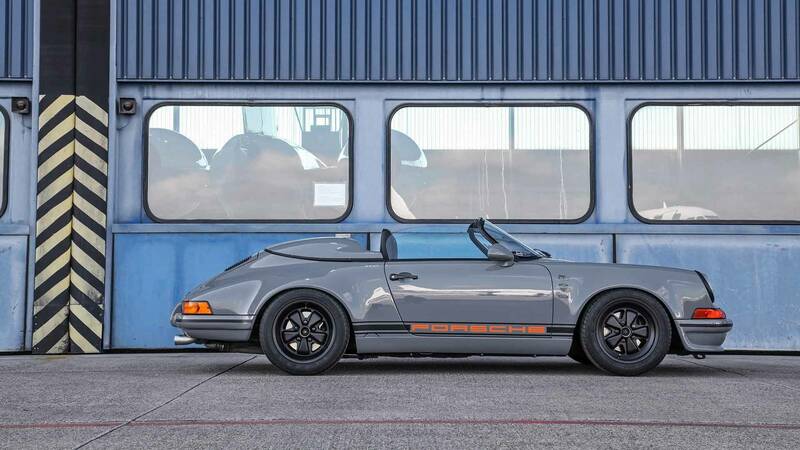 Luckily, for Porsche fanatics everywhere, this particular Speedster was built up from a far-less-rare 1989 Carrera 3.2 Targa. The owner of this 911 had already completed the Speedster conversion, but deemed the look 'too modern' to be properly enjoyed. That was when the Porsche was dropped off to DP Motorsport for a full visual backdate. With the aesthetics of a 1973 911 in mind, the famed Porsche bodywork builder set to work crafting custom panels for this car's unique look. They're calling this the "Phantom Speedster", which is strangely fitting. The Porsche, in its current state, is largely mechanically similar to the Carrera 3.2 on which it is based. For now, the 911 has received nothing more than a set of H&R wheel spacers and a lower ride height. 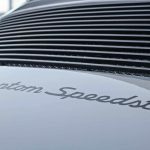 This winter, however, the Speedster will get a bump in power with a custom performance exhaust, a larger throttle body, and new camshafts. It will, at the same time, receive a fully adjustable KW Clubsport coilover suspension kit and new wheel bearings. Visually, however, the converted Speedster has been given an interesting early 1970s 'longhood' look that somehow works quite well with the speedster bits. With the fenders, bumpers, hood, and rear tail panel swapped out for the earlier-look pieces, only a few pieces needed to be manufactured to complete the look. DP decided on a set of 993-style aero mirrors, which don't look quite right to my eyes. Their lower rocker covers are a completely custom affair that give the 911 a more vintage look, while hiding the oil-cooler lines running underneath them. Similarly, the front bumper's valance needed to be modified to hide the oil-cooler itself. In particular, the 1973-only black metal engine lid grille is my favorite piece of the puzzle. I have installed one of these on my own 912E, and it gives the car a uniquely vintage look that is far more sharp to view than the faded plastic piece it replaces. Inside the car everything is largely the same, though a unique alcantara covered steering wheel, a color-matched metal shift knob, and a modern stereo system have been added. The 1989's interior remains mostly intact, from the seats to the carpets to the gauges on the dashboard. 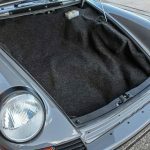 In and of itself, unless you actually know the difference, the average Porsche layman wouldn't notice anything out of place to a 1973-style interior. Painted in Audi's gorgeous shade of Nardo Grey a non-metallic medium grey, and outfitted with lots of deep shiny black finished accents, this backdated Porsche looks equal parts modern and vintage. The all-black semi-gloss Fuchs are a very nice touch. It is the bright orange side stripe that really catches the eyes, however. This is a fetching car with lots of carefully done unique features. The vintage look doesn't quite work with the huge widened fenders of the Speedster's turbo-look widened fender flares. Were this my Porsche, I'd have stuck with the narrow body fenders. In any case, it's a fun and interesting build. The world would be a boring place if we all shared the same taste. THE Porsche tuner per se is dp motorsport with its operating main business in Overath, near Cologne. 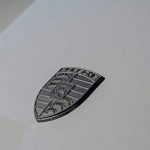 Already established in 1973 by Ekkehard ZIMMERMANN, nowadays, his son Patrick ZIMMERMANN and crew make sure that the renowned company's name remains a resounding topic in the Porsche scene – of course, with the active support of the father. 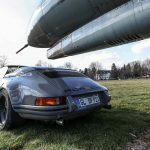 A Berlin-based client – who priorly refurbished a 356 C-convertible almost by himself – assigned dp motorsport to “backdate” a Porsche 911 Speedster as it was perceived as “too modern”. 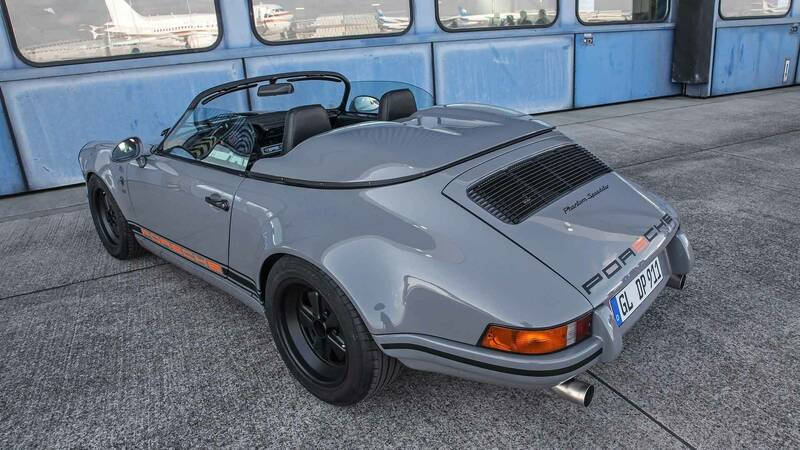 Apparently, this particular Speedster already underwent a Phase 1; manufactured in 1989 in sunny US-American California, the original 911 Targa 3.2 converted, after meticulously detailed work in the late 1990s, into a Speedster. Subsequently, it made its way to Germany. The Phase 2 upgrade at dp motorsport was implemented by applying the F-Model-Body kits dp11F Carrera-Widebody. Its combination of one inch wider wheel housings, a slightly lowered front bumper, as well as unobstrusively designed side sills that are truly captivating. A brilliant and thoughtful feature: these side sills cover the oil pipes in order to provide a more attractive trim at the bottom edge of the sills. By the way, the Overather expert team developed the design to achieve an even more sporty and vigorous appearance for the elderly 911. The vehicle height adjustment is handled via the shifting of the torsion bars and the usage of H&R spacer discs “improve” the wheels. The existing 2-pipe rear mufflers are visually adapted to the modified rear bumper. 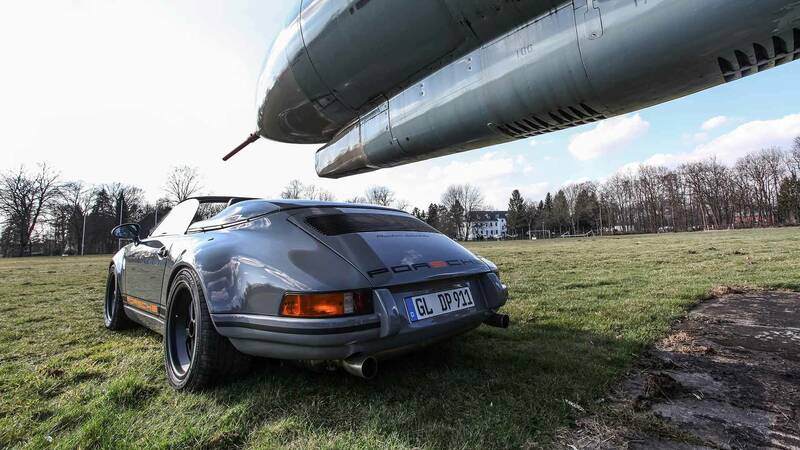 Because of the paint job in Nardo-gray, the already extremely flat 911 almost looks like a fighter jet. The front luggage compartment carpet still looks like it was made for a different car, though! Fits where it touches.